What food does a young pregnant woman need to eat to keep her and her unborn child well? Help them stay healthy. Developing new food products for multinational companies. Implementing nutrition policies in the community. Analysing menus in a care home. Understanding the link between foods, diets, dietary patterns, nutrients, and physical health is paramount in the current environment. And that’s where nutritionists can help. You’ll look at the issues that make the headlines and the topics that touch our everyday lives. Whilst our relationship with food has never had a higher profile in the public sphere, the food industry is constantly adapting to new consumer trends and developments. Many dietary factors can influence a person’s health, and throughout our course, you’ll gain a working knowledge of a range of contemporary nutrition issues such as the origins of nutrition-related illnesses, the chemistry of food and dietary assessment. You won’t simply learn the theory behind nutrition, you’ll explore how it works through practical sessions. We have chemistry and microbiology laboratories, a taste panel suite, a product development kitchen, a bakery and food quality testing equipment. We also have the capability to produce and develop new food products, test and analyse them, taking them through to the packaging and labelling stage. This creates a holistic approach to our teaching and means you gain real life experience whilst studying with us. Employability- You can spend your third year on a placement, working in industry to gain valuable skills and experience. Approved course- Our course is accredited by the Association for Nutrition. Outstanding facilities- You’ll have access to our food and nutrition suite, which includes three food development studios and a physical testing studio, as well as bakery and food quality testing equipment. Industry links- We’re home to the Manchester Food Centre (MFC) which connects the university with industry. Extra curricular- You can join MetMunch, an award-winning, student-led sustainability and outreach programme. "On my placement at Coop Food, I worked within the protein team as a Food Technologist. On a day-to-day basis I would make sure that foods are safe to eat, that they are compliant with our codes of practice and above all, protect the brand identity." Our nutrition courses help to prepare you for a variety of opportunities within the field of food and nutrition, from public health and product development to working with sports teams. Some of our current students have gained work experience with Nestle and Cooperative Food. You have the option to complete a placement during year three if you choose the four-year sandwich degree route. The day-to-day demands of an industry placement are challenging and inspirational, and the experience is invaluable for both your final year of study and your employment prospects. It gives you an advantage when you begin looking for your first job upon graduating. 112 UCAS Tariff Points at A2 (Grades BBC) or acceptable alternatives e.g. BTEC Subsidiary Diploma, Diploma, Extended Diploma at Level 3 (Grades DMM) to include a Science subject at A2/AS, we do not accept Health & Social Care. BTEC's with a significant science focus may be considered. GCSE grade C/4 in English Language and Mathematics. Level 2 Functional Skills English and Mathematics also accepted. Some Science knowledge is required at either A or As level. Alternatively Level 3 BTEC Extended Diploma or BTEC Diploma in Sport Science. Nutritional sciences gives you the opportunity to gain specialist knowledge and skills in food science and manufacturing so you are able to advise on diet, evaluate treatments, write health reports and analyse food. Year one develops the knowledge and skill base necessary to start a career in nutrition and succeed in higher education. Areas of principles of nutrition, food composition and analysis of food, overview of function of human body systems and their involvement in processes relating to food and nutrients are delivered. Alongside these, aspects of food choice as well as current local and global nutrition issues are explored. Nutrition 21 is a unit that is changeable, hybrid, interconnected to technology and social media, relevant to fast pace changing local and global food conditions, student centred, active and flexible. Physiology and Health provides understanding of food safety, monitoring and controls of microbiological, physical and chemical risks of food and the relevance of human physiological systems to health and nutrition. This unit introduces food nutrients, food ingredients and their changes occurring in processing. It also covers the principles underpinning food processing and sensory testing for quality evaluation. 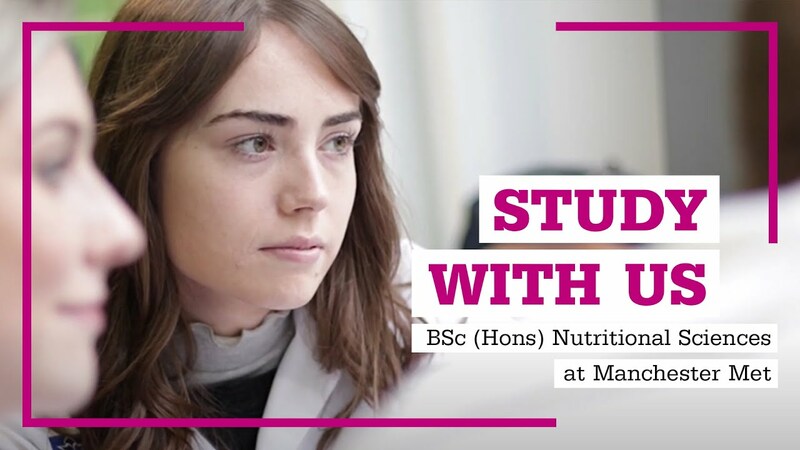 In your second year of study, the core units will allow you to develop and synthesise the knowledge assimilated in your first year, exploring research in nutrition, developing critical skills and further progressing the skills required to practice successfully and confidently in the nutrition and food sector. Structured and assessed work-based learning will be embedded into the course in order to provide you with work experience and the ability to articulate your transferable skills. Optional units will allow you to select an area of specialism for future practice in particular areas of human nutrition or food and nutrition. Focuses on the development/appraisal of professional practice at an individual level, including effective self-management, presentation and critical thinking skills. Dietary Assessment introduces you to practical solutions to determine the nutritional status of individuals. Applied nutrition explains the link between nutritional intake and common nutritional disorders. stage of the lifespan and the maintenance of positive dietary health. Dissertation. You will be expected to conduct a piece of individual research on an appropriate topic relating to your degree. This unit incorporates a range of research methods with a final written submission. underpin health interventions and their practical application in public health. In your final year of study, the core units will equip you with confidence to independently assess and utilise the evidence base for nutrition and reinforce your transferable skills relating to research project management and enable your transition to become an independent nutrition practitioner. Furthermore, optional units allow the development of skills in chosen areas of public health, health promotion, clinical nutrition or aspects of food science depending on your career ambitions. All of the books required for the course are available from the library. The university offers 24 hour access to computers with the Adobe software we teach. There is also a laptop loan service so whilst a personal laptop (preferably mac) is beneficial it is not essential. However, many students choose to buy some of the core textbooks for the course and/or a laptop. Students may also need to print some of their assignments and other documents. Campus printing costs start from 5p per page. Estimated costs are £300 for a laptop and up to £100 each year for books and printing. Level 3 CIEH training and assessment (£75) offered within Physiology Health unit is optional. There are no other costs in first year. In second year, optional HACCP training (£75) is offered to Nutritional Sciences students. In final year, dissertation printing and binding will be required. For the placement year, costs vary hugely between countries and areas, so it is very important to research costs well ahead of time and budget accurately. The Level 6 fieldtrip (£50) is entirely optional. Attendance at Food Matters Live for one day is optional and the cost is the cost of the travel to and from London ExCeL.